We Catholics are near the beginning of the liturgical year. The Advent/Christmas cycle is over and we are in what the Church now calls Ordinary Time. Ordinary here does not mean regular or common. It rather refers to an ordered presentation of the Gospel message, the Christian Mystery as we go through the weeks that are not related to Christmas and Easter. I this particular year the Gospel of Mark will be the principle one used on Sunday, though because Mark is so short there will be occasional use of the Gospel of John. Mark, the first Gospel to be put in writing, is brief and to the point. Today the Gospel text is from Mark 1:14-20. Mark gives us no nativity story, as Matthew and Luke will later do, and no great prologue as John does. He gets right to the point of Jesus ministry and so near the beginning of this passage Jesus has come to Galilee after being presented to us by John the Baptist, and He extends His basic invitation, "This is the time of fulfillment. The Kingdom of God is at hand. Repent, and believe in the gospel." (Mark 1:15). What are we to make of this call to repent? We get off on the wrong foot if we think that it means simply to feel sorry for your sins and change your behavior. It does mean that, but so much more. A little example might help us to get at what Jesus is inviting us to do. Today we live in a new reality called the high-tech age. Statements that we can make today such as "I took a picture this morning with my cell phone," or "I posted on Facebook," made no sense just a few years ago, but in this new reality they make perfect sense. When Jesus invites us to repent He is inviting us to accept a new reality, a new way of going about in the world, a new way of seeing God. In many ways this new vision makes no sense to those who are outside of it. This new vision is called the Kingdom of God, a kingdom which is not a place in this life or even a place to go in the next but a radically different way of doing things. Some modern biblical scholars suggest changing it to a verb--the reigning or ruling of God. The Kingdom is among us already when God is ruling our lives. It is not yet here in its fullness, but is always breaking forth among us. The Scriptures use various words to describe this God ruling way of life, words such as peace, justice, forgiveness, healing, reconciliation. Jesus' Himself goes on to describe it in parables. The challenge for us is this.Have we really bought into God's different reality, a reality which is foundational and which directs all of our thoughts and actions, or are we still trying to fit God's ruling, God's reality, into the many kingdoms of today's world. This evening I will be watching the New England Patriots play the Denver Broncos in an NFL playoff game. I will be rooting for the Patriots. After all, I am originally from New England. This is not a sports blog so I will say nothing more about the game itself. I am writing because of the attention drawn to Denver quarterback, Tim Tebow. By all accounts Mr. Tebow is an outstanding human being off the filed and a devout practicing Christian at all times. I wish that there were more Tim Tebows among professional athletes. What is at issue is not Tebow himself but the way that the nation and the media are reacting to him. For one thing he is not the only devout practicing Christian professional athlete. Troy Polamalu, a defensive back for the Pittsburgh Steelers, fits into that category even though he doesn't look the part and there are many others. Tebow has a great deal of athletic ability but even though he has had his spectacular moments at times, including a game winning touchdown pass last week, he is at best, right now, a mediocre quarterback with a unique playing style. So why the reaction to him? Why has he become in some opinion polls the most popular professional athlete in the country? I think that the answer lies in the public's desire to have the perfect hero contrasted with the desire of some to wait for the hero to fail. There are unfortunately today some people who hate religion and religious practice. Many in this crowd delight in Tebow's moments of failure. There are others who admire him so much that they are blind to the facts. They place him alongside the elite athletes in sports, a place he has not yet earned, and some even think that God guides the football every time that he touches it. After seeing report after report of scandals among athletes and other public figures whom we thought to be heroes we want to have the perfect hero, the one who lives a virtuous life and who excels in every way in all endeavors. That person is hard to find. In fairness to Tim Tebow let us simply applaud him for being a fine Christian and a fine human being. Let us wish him the best on the playing filed, but let us assess his talent for what it is and is not. Most importantly let us teach our kids to emulate his behavior rather than that of others who may have more athletic accomplishments. As we start off this year of 2012 I am in Margate, New Jersey, just south of Atlantic City, working on a book with the same title as this blog, The Wandering Friar. The book, however will not for the most part use material written here, but will be filled with some stories taken from my life and many taken from the lives of folks that I have met over more than 40 years of ministry as a priest, and especially over almost 25 years as a traveling preacher. So please do pray that I complete this work by June and that you can have a copy by next Christmas. Yesterday the Church celebrated the Feast of Mary, the mother of God, and also observed a world day of prayer for peace. 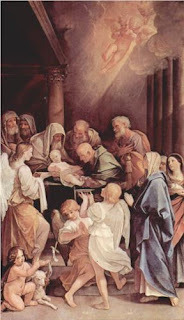 At one time we celebrated this day as the feast of the Circumcision of Jesus. While on the one hand it would seem that the Church doesn't quite know what to do with New Year's Day, a purely secular event, and tries to baptize it with a Christian feast, I think that there is something important to be celebrated on this day which is really the octave of Christmas. The Church, taking a page from Jewish custom, keeps all great feasts for 8 days. Right now Christmas and Easter both have octaves. I would hope that the Pentecost octave would be restored, but that is for another time. The 8 day period, extending beyond to Epiphany, gives as the chance to reflect more deeply on the mystery of the Incarnation, a mystery which not only touches on our belief that God fully took on humanity in Jesus of Nazareth, but also that this mystery continues in the Church, the Body of Christ in the world. I think that we find the entry of the divine into the human too good to be true. It is interesting that the first major heresy in the life of the Church was not a denial of Jesus' divinity, but docetism, a denial of his humanity. St. Luke in his nativity account is giving us theology, not history. By including the circumcision of Jesus in that account he is not only telling us that Jesus observed all the requirements of Jewish law, but that indeed he was human in every way, indeed quite totally a male human being. John tells us that the Word became flesh, not that the word appeared to be fleshly or human. The humanity/divinity of Jesus was debated strongly over the first centuries of the Church's life and the last declared doctrine relating to that came at the council of Ephesus in the fifth century in which Mary was declared to be the Mother of God, in other words the mother of the divinity as well as the humanity of Jesus. This is important not so much for what it says about Mary, but for what is says about God, that God desired to enter fully into humanity, into and through the body of a woman. I believe that it is vitally important that we reflect on this mystery for we still find it hard to believe that God wishes to be one with creation, even in and through us who are the Body of Christ in the world. We need to say yes to that mystery, as Mary did. To the extent that we do that we will have a Church that is believable as the Body of Christ, and not one beset by scandal. In 2 Cor: 4 St.Paul tells us that we carry a treasure in earthen vessels, and that we carry the dying and rising of Jesus in our bodies. Think about that. If we did would we mistreat our bodies in the way we do? Would we bounce between hedonism and prudishness in dealing with sexuality? Would we act violently in dealing with other human beings? Indeed on the world day of prayer for peace might we draw closer to peace in the world by respecting "every body", born and unborn, of whatever race, nationality or religion. Peace to all people of good will!